Disponible en français. No guarantee on this english version. Working collaboratively in an offline fashion with a local server for Projet Espace OpenStreetMap Francophone actions : we wish it for a long time. It’s now done : a technical solution has been implemented during April thanks to the Internet Cube Project, based on the Yunohost operating system. Real situation tests has begun on April, the 30th, in Cotonou, Bénin, at the begining of the OpenStreetMap Bénin action announced in a recent blogpost. This mission is also an opportunity to spread the Yunohost and Internet Cube projects. 1 – Why a local server ? Email, file sharing, collaborative documents, social networks … bunch of people use these services to communicate and collaborate remotely everyday. For example, Google Drive, Dropbox, Skype etc. (if we think about proprietary softwares). But free, community-based, privacy respectful softwares aslo exists (hopefully), for example OwnCloud, Etherpad, XMPP etc. If you want to test some of these free services, you can try those which are made available by the Framasoft association, which support free softwares and launched the #degooglisonsinternet campain. Generally these tools are used to communicate with remote people but they are also so useful for IRL events (conference, barcamp, mapping party for instance), to write documents collaboratively or create a download access point for participants etc. But all this tools need an operational internet connexion : it’s expensive and users depends on network vagaries, especially in low connectivity countries. And whatever, in a pragmatic point of view : do we need to connect to servers half a world away while we are all in the same room ? In October 2015, within Les Libres Géographes (LLG) collective (Amadou Ndong, Nicolas Chavent, Séverin Ménard and me), we have did the step to migrate our Information System towards a free solution : a Paris hosted Yunohost system, installed on a Virtual Private Server hosted by Gandi. Thanks to thats, we have been able to reduce by 90% our Gmail, GoogleDrive, Skype, Dropbox etc. usage, using instead free alternatives. Considering our Yunohost project experiment since October 2015 at LLG, we decided to deploy the same technical solution at ProjetEOF, and you are now reading the blogpost on the Yunohost WordPress app ! Looking for a local hosting solution, we naturally explore the Internet Cube Project wich is a Yunohost ditribution packaged to work on an Olimex board (open-hardware with the exception, unfortunately, of the chipset as usual, and the antenna) which is a kind of small screen-free computer used as a transportable server. Internet Cube first usage is to secure your internet connection from your ISP (Internet Service Provider) and to auto-host your services (emails, shared documents etc. ); which you can carry easily with you by re-plugin your Cube to another ISP box. We had to change the Cube original DNS configuration to be able to use it locally. This changes has been documented on the Yunohost project forum (french). 4 – What can I do with the Internet Cube ? All this without an internet connection ! 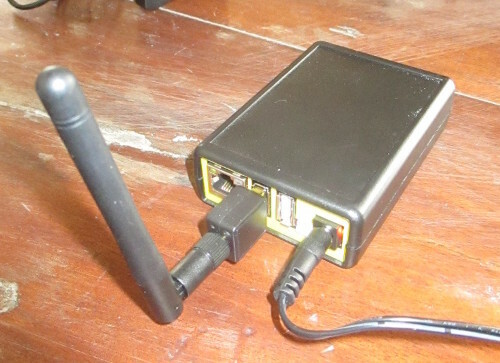 Powering-on the Cube, 2 Wifis networks are available thanks to the antenna : an open-access network to join the PirateBox and an WPA password protected network to join Yunohost applications. Numerous apps are available, you can check the available applications list. Choosing the Internet Cube and testing it during this Bénin action enable all the missionaries and volunteers from Burkina Faso, Ivory Coast, Mali, Niger, Senegal, Togo to be trained to Yunohost usage and administration ! Over 15 OpenStreetMap missionaries and volunteers from free softwares and open data local and sub-regional communities are discovering the Cube. 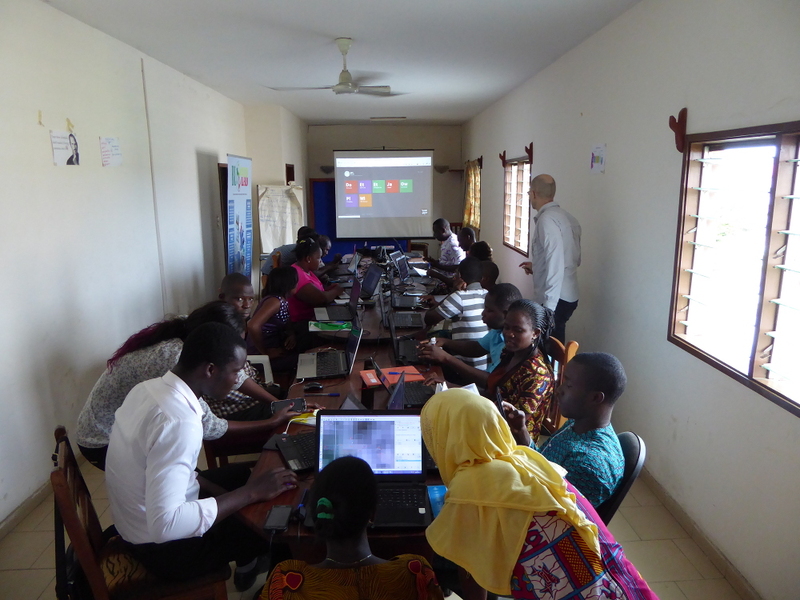 40 more OpenStreetMap Benin action beneficiaries will use the Yunohost public applications. Some West Africa OpenStreetMap communities representants and, extensively, from free softwares communities, expressed their will to get an Internet Cube for a local use ! Its efficiency for limited well-trained working group (5 or 6 people) is impressive, it allows people to use web applications locally almmost 10 times faster than a classic internet connection. 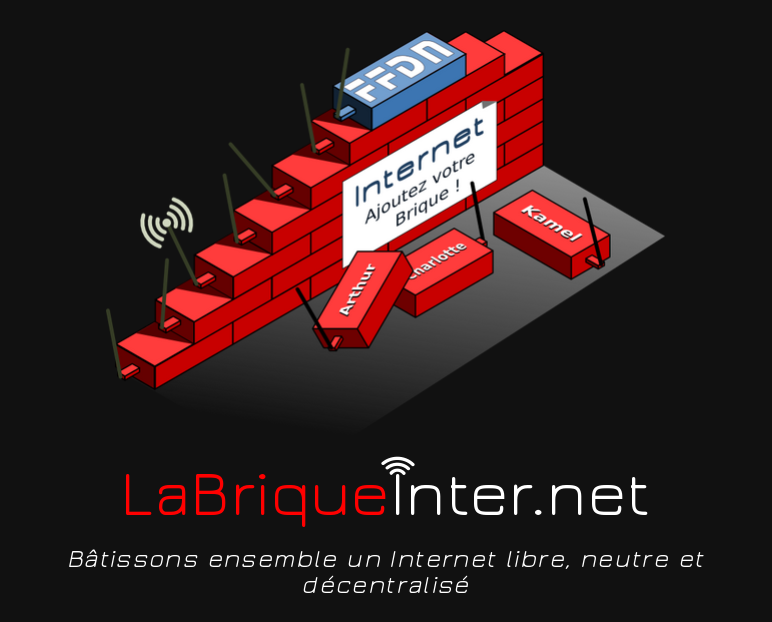 Hardware selection, installation and operating system & apps configuration has been documented and published freely under CC-BY-SA (french) on Les Libres Géographes Dokuwiki. we need to find a technical solution to synchronise Cube datas : here in Cotonou we work with 2 Cubes, one for each working group, and we have some difficulties to synchronise each night our changes. We’ll need to find solutions to continue to train and equip local communities with Internet Cubes, maybe thanks to a crowdfunding as we did last month to get high-res satellite imagery on Cotonou to improve OpenStreetMap. Thanks to Yunohost community for their great and generous idea ! Thanks to Internet Cube community, especially Tharyrok from Neutrinet (Belgium) of the FFDN network (associative ISP) who helped me on IRC to get an operationnal image at the begining. Thanks to Doug713705 from Tetalab (Toulouse) for help on DNS configuration and to Tetalab for hosting.